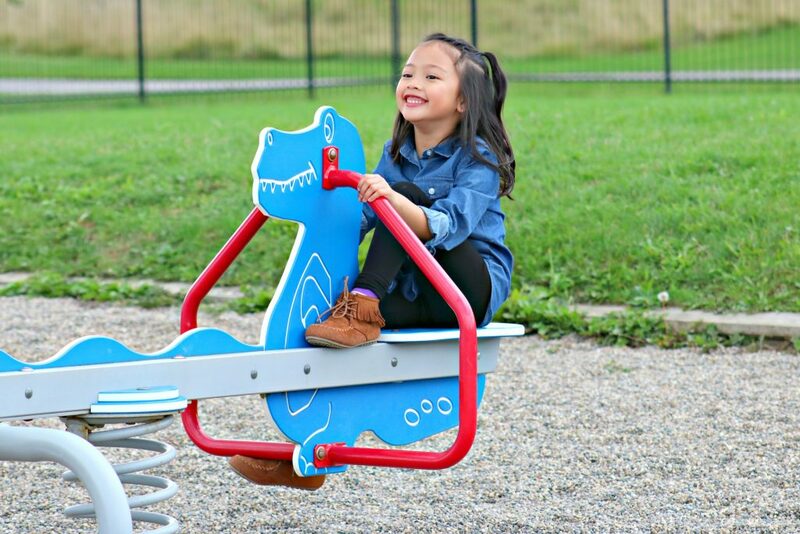 You are here: Home / Product Reviews / Babies & Kids / Amazing Kids Fall Fashion from Joe Fresh to Try Right Now! Fall Fashion from Joe Fresh! One of the best things about being a mom to daughters is the fashion. Both my sister and I have always loved to dress them up in all the pretty things. Since the girls were babies, one of our top choices for fashionable and trendy clothes that are durable, is Joe Fresh. They even have the cutest things for boys too. 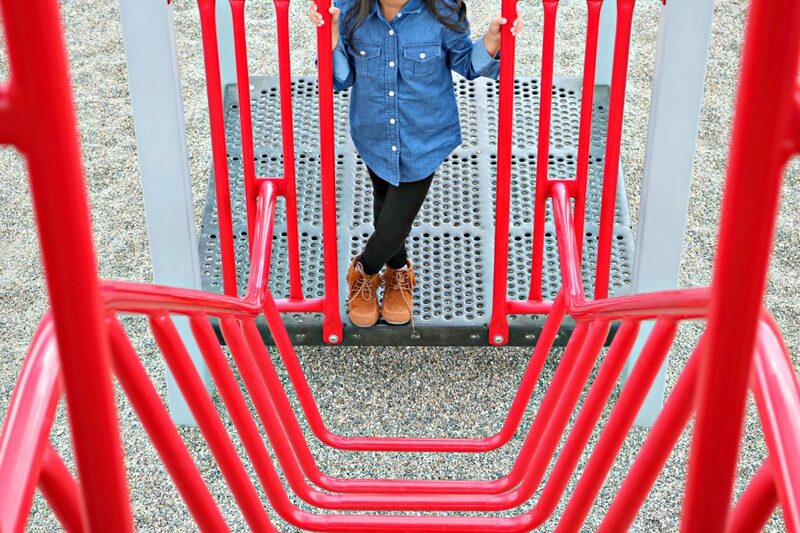 If you have kids, make sure to check them out for amazing kids fall fashion that you need to try right now! School is already under way and of course, back to school shopping was one of the things on our to-do list. We had the opportunity to check out the latest fall fashions at Joe Fresh and we were not disappointed. As always, they have the CUTEST clothes that are IN. They have all the colours and the styles that are super hot right now too. Best thing is that they have clothes for babies, toddlers, girls, and boys. Of course, they have clothes for mom and dad but, that’s a story for another time. Most of the time, my sister and I shop together and whenever she gifts the girls with clothes, they’re almost always from Joe Fresh. Truth be told, they last a long time. Since my girls are far apart in age, I’ve saved a few pieces from Gabs for Mimi and they’re still rockin’. We had the chance to head to our nearest Joe Fresh and to buy a few outfits for the girls for fall. When it comes to making outfits go a long way, I always make sure to pick out tops that can be worn with basic tights and a staple or signature item that can be interchanged. That way, we can swap and create new looks! Mimi’s first look was a Kid’s Crew Neck Tee in light pink, adorned with a cute and trendy tropical design. I paired it with Kid’s Leggings in black. I dressed it up with a denim vest and with a pair of high-top sneakers that her aunt bought from Joe Fresh in the spring. It’s a perfect outfit for back to school when it is still a bit warm out. Mimi’s wardrobe is compiled of many items but, one of her favourite go-to’s are printed-tees. It’s no surprise since they’re comfortable. Joe Fresh has so many cute tees. It was so hard to choose! They also have the Freshsters who are a group of really cool cats, bunnies, foxes, and bear. They are implemented in a lot of the clothes this season and they are so cute. The next pick was picking out a staple item for Mimi. It’s a gorgeous Denim Moto Jacket that can be interchanged and matched with almost any shirt or dress. It’s worth the price since it adds to their wardrobe and helps you to keep shaking things up. I paired it with an adorable Printed and Pleated Print dress adorned with dainty roses and black leggings. Shoes are definitely a must! We usually buy a pair of fall fashion boots and sneakers every year. This year, we found a darling pair of tan fringe boots. They match with so many outfits and contrast many other colours. She loves them and they’re easy for her to slip into and move in. This outfit was Mimi’s top choice for her first day of school. She picked it out the day before and was so excited to wear it in the morning. The medium-wash denim shirt is so trendy. Paired with the same kid’s leggings in black and fringe boots. It made for an outfit that even I envy. 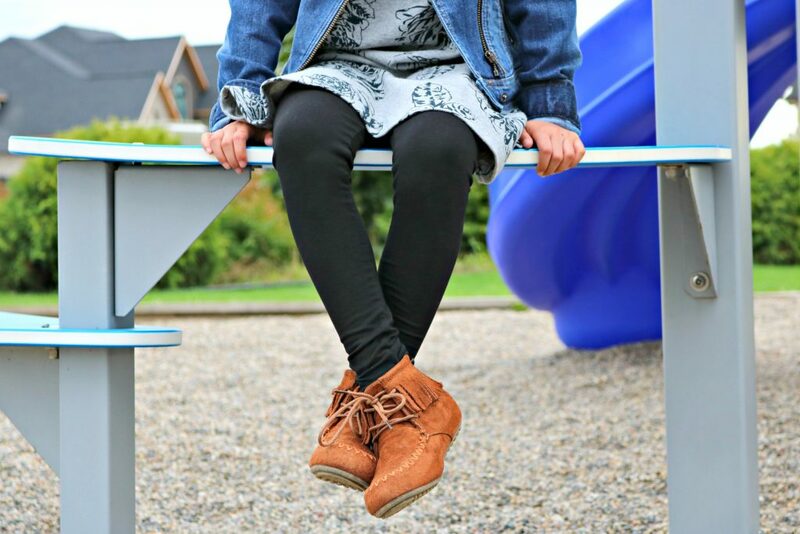 Such a cute style that is not only in style but, age-appropriate. 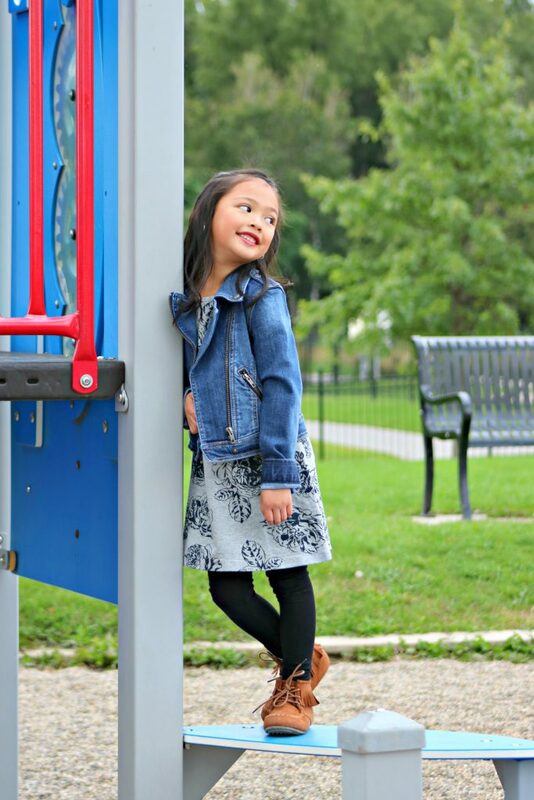 Mimi is all set with a few fun outfits from Joe Fresh now and she can use them throughout fall and into winter. But, who’s kidding who? I’m excited to see what they have in store for winter. 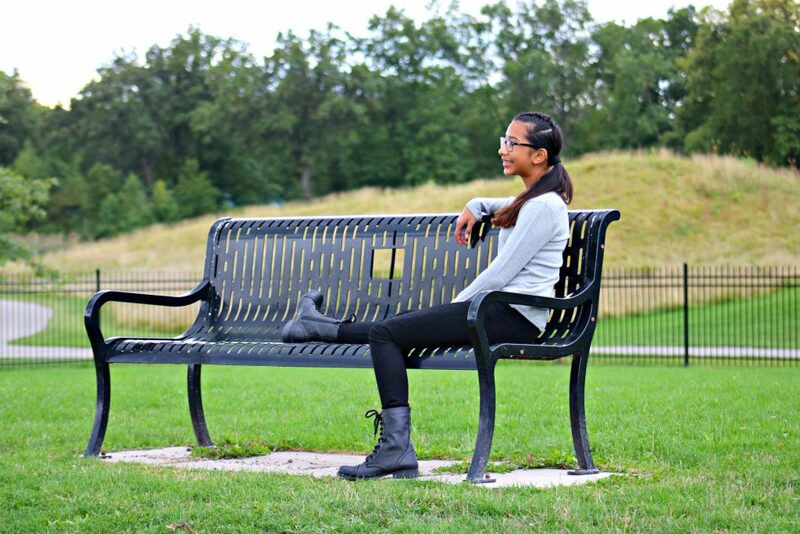 Now, Gabby picked out some casual styles and an active wear look. The first outfit was a really sassy outfit. 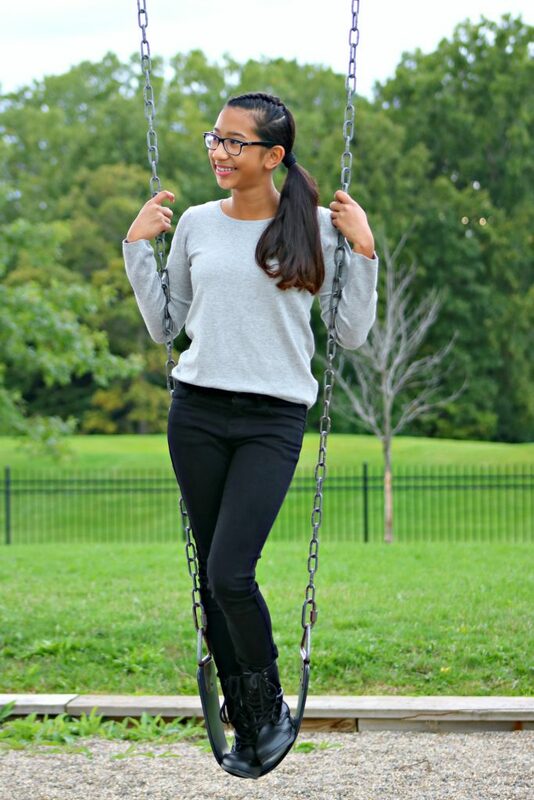 For some reason, I noticed that girls Gabby’s age are digging the more neutral colours and this gorgeous high-low sweater in a light grey mix is it. It’s warm, soft, breathable and teen-approved. She paired it with a pair of black skinny jeans and her favourite boots. 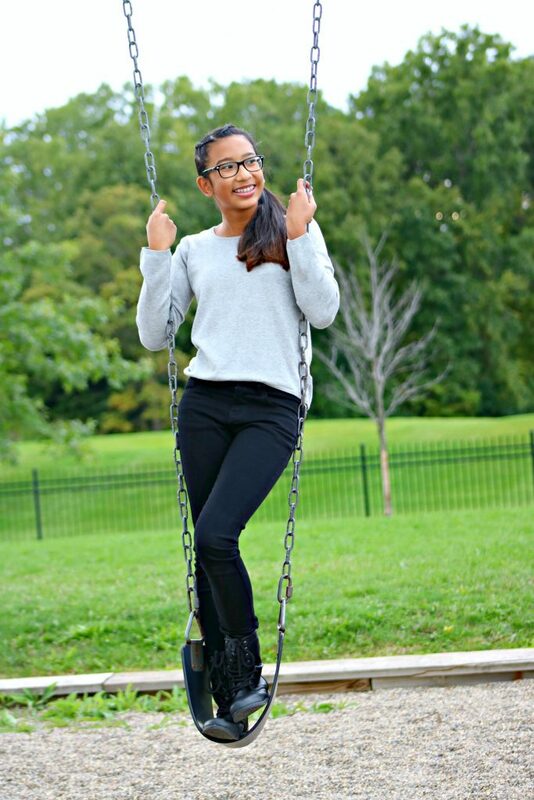 Gabby is athletic and while she has always loved to dress up, she prefers clothes that can keep up with her. Printed tees are definitely a go-to. Of course, she chose a back seam tee with a quote that she felt was fitting to her. Pretty powerful. She loved the saying, I loved the fact that the shirt was longer in the back and shorter in the front. Since teens and tweens live in leggings and jeggings, I’m glad that Joe Fresh has shirts like this! She paired it with black leggings and she was ready to go! Another item Gabby absolutely adores are zip-up jackets. She’s always a bit chilly and when she’s not, they make a cute accessory to tie around her waist. The Funnel Neck Zip jacket is a fun colour in neon purple and can definitely keep up with this track star! You can get the matching leggings or wear black leggings, you can’t go wrong. 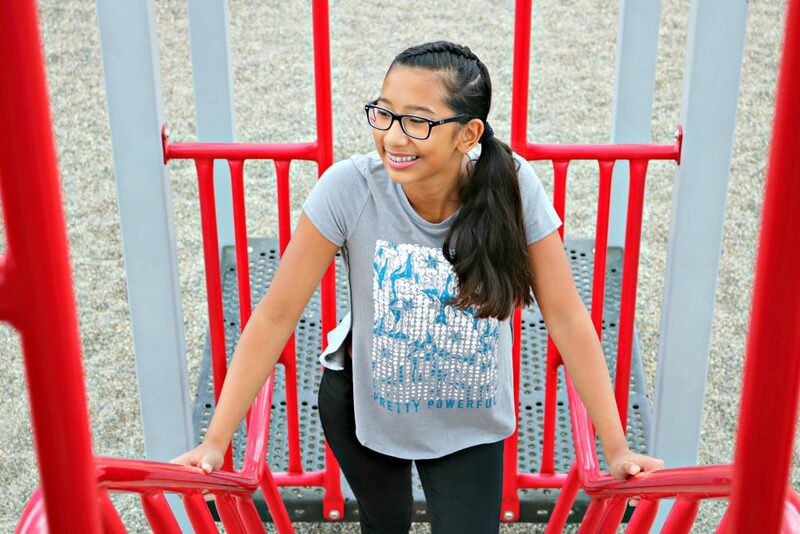 Gabby especially loves the thumb loops because they keep her warm and have more coverage when it gets cold! 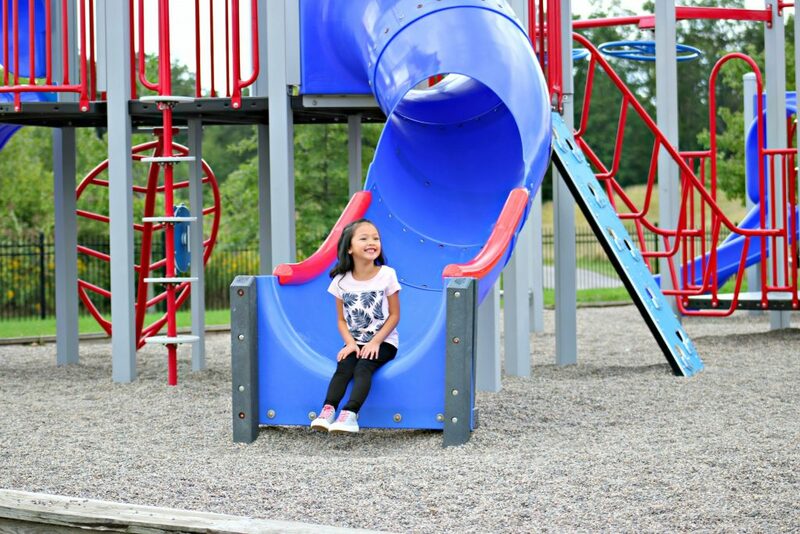 Fall is right around the corner, so it is a great time to pick up staple items and cute clothes for the kids to wear into winter. They have so many styles to choose from, you’ll have a blast shopping. I know that we did and we are going to head back to pick up some pajamas because they have the cutest two-pieces. But, for now, I think it’s safe to say that we are stocked up on fall fashion and I may be biased but, I think the girls are rockin’ it! For more information and to shop these styles, head over to Joe Fresh’s website. Get social and check them out on Facebook, Twitter, and Instagram for the latest updates. 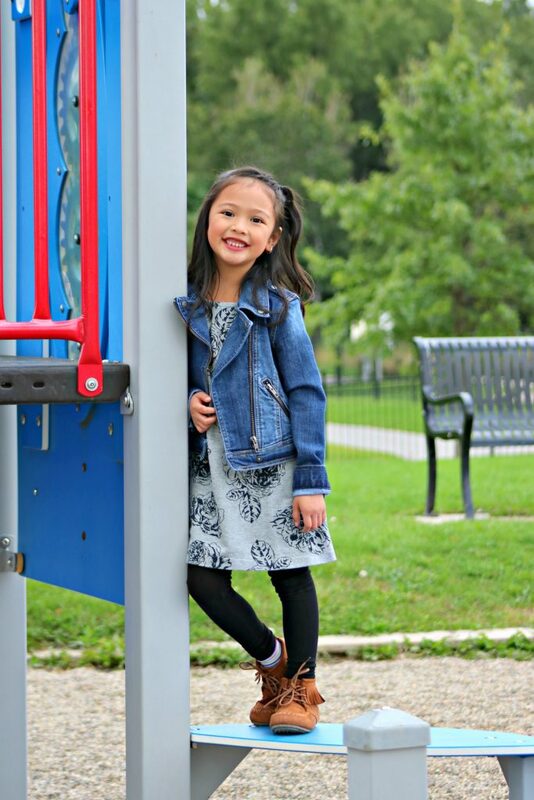 Which fall fashion item would your child love? Very cute stuff they have! My daughter loves her denim! I was not familiar with the Joe Fresh company. They have such cute clothes and the prices are very reasonable too. Very cute clothes check it out! I love the jean jacket look! I know my babes will look amazing in these styles for the Fall season! My youngest daughter loves her denim vest and jackets. I have never heard of Joe Fresh. These clothes are adorable. Makes me wish I had a little girl to dress again. Joe Fresh can be found at all the Zehrs and Superstores across Canada. They have the cutest clothes for boys and girls! The new Joe Fresh clothes look great. I’m loving the fringe boots! I’m glad they have a good selection for this Fall! Joe Fresh is always on point with their style! The boots are too cute! These are really cute outfits from Joe Fresh. I really like that denim vest. The denim vest is one of my faves! You can’t go wrong with a pair of basic black leggings. They can be paired with so many different pieces of clothing. Joe Fresh makes some cute clothes for kids! I totally love that gray floral top. Hehe that’s my fave top too! I want all the outfits for ME! I know they are kids clothes but they are so dang cute. I have been buying Joe Fresh clothes for my kids for over 12 years now and have never been disappointed with the quality for the price. Me too! They always have cute clothes! Both of your girls look adorable! I love that comfortable clothing can be so in style. Thanks! The most important thing is being comfy. The girls are absolutely rocking it and seem to be enjoying the little photo shoot too! The outfits are adorablly chic! Your kids look so cute!! Two little models! I love how stylish the little one’s outfit is for her age!! Oh,i love the choices the girls are wearing and Gabby your getting so tall ! Gabby is taller then me now! I’m obsessed with Joe Fresh clothes for kids (& adults). The prices are awesome & the quality is good! They have the cutest kids tshirts! Me too! I love that you can find what you want at Joe Fresh. They have the cutest clothes! I love the dress and Jean jacket! Going to check it out! Such cute outfits! I haven’t tried shopping at Joe Fresh yet for my son. I’ll browse the site later and see what I can find for him.. They have the cutest and coolest clothes for boys! They are little fashionista’s! I’m going to miss those days when it comes too! First, your daughters are SO cute! We don’t have a Joe Fresh store here, but I love the styles they carry. My kids are all in the stage of picking out their own clothes, and would love a store like this! Aw thanks! This store would be perfect for your kids! scored a sweet little dress for the fall weather for my kiddo! They have very cute dresses! I love the Demin items they have and got a few things for my granddaughter! They have such cute clothes! Everything is so cute and functional! Makes me wish I had a daughter to shop for, although Joe Fresh always has adorable boy clothes too. Your girls must have had a blast doing this photo shoot. They love photoshoots! and yes Joe Fresh has so many cute clothes for boys and girls! It looks like Joe Fresh has a lot of cute stuff. I am off to do some shopping…. I love everything that you have here. She is a darling model. I’ve never heard of Joe fresh but I definitely need to they get some cool stuff. Aw thank you! They have some very cute clothes for boys and girls! Oh my gosh, your girls are so pretty! I love their outfits. That denim jacket on your youngest is great! Thanks Stacie! She loves that denim jacket so much! Those are excellent looks. I love that they’re fashionable and fun without being risque. It’s unbelievable to me some of the things I see girls wearing these days. Tell me about it! Joe Fresh makes some really great clothes! ADORABLE! How cute are these little models? Joe Fresh is really a cute line of clothing. Especially with such adorable little ones showing it off. How cute is that jean jacket look? Adorable. I am going to have to go check out some more about Joe Fresh and see what I can find for my littles. My youngest daughter loves her denim jackets! I wish we had Joe Fresh nearby. They have a great selection for fall. That’s too bad they have really awesome clothes right now! These are some really cute clothes. I love when brands have things that look so stylish for younger kids. Very cute stuff! I buy clothes for my girls there all year round! I have a few Joe Fresh outfits that I love. The clothes are so durable and stylish. They are perfect for kids to wear to school. The wide selection they have won’t disappoint anyone! They have so many stylish clothes! Hehe me too! They should make matching clothes for little girls and their moms! Love these fun fall styles! All of the denim is my favorite, especially that awesome jacket. I look forward to checking out the Joe Fresh site soon. Denim jackets are making a come back! 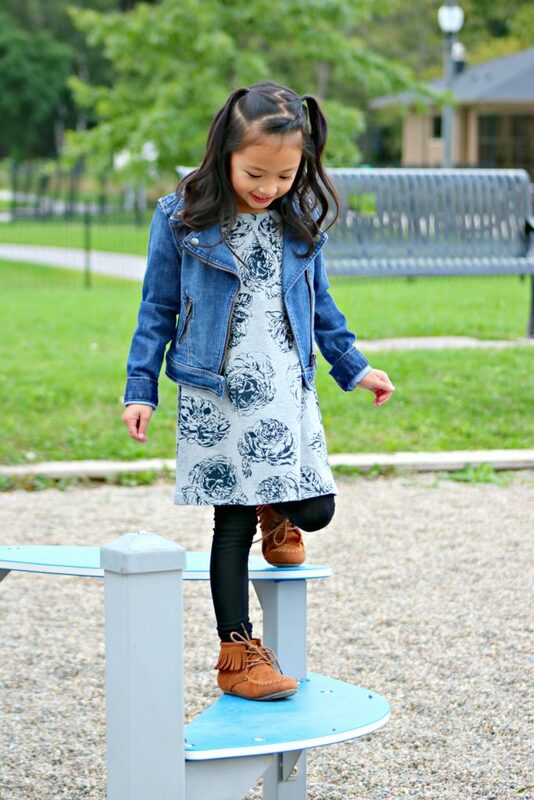 That grey floral dress is just stunning on your little girl! I absolutely adore Joe Fresh and their line of clothes! It’s so cute! She loves that dress and yes Joe Fresh makes awesome clothes! Thanks for taking your time and reading! 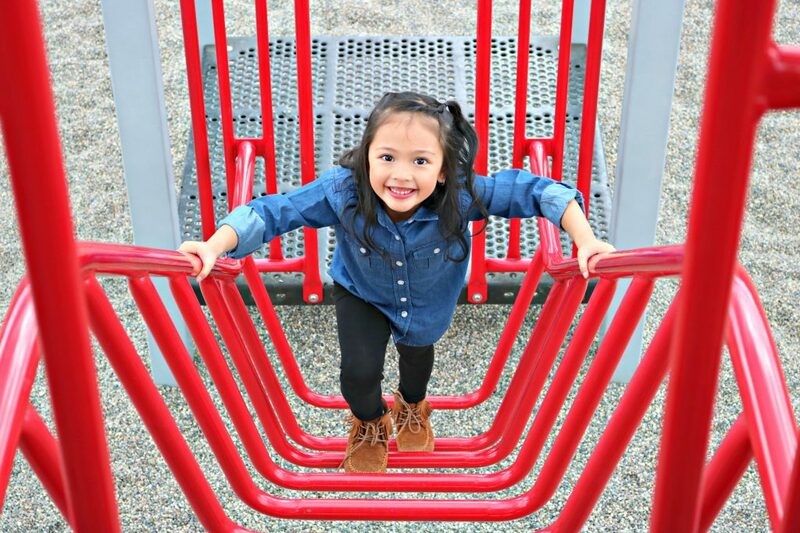 I LOVE these cute and on-trend clothes for kids! Honestly – they are clothing I would wear if in my size! VERY stylish and your models both did an amazing job! I think it is so cute that jean jackets are back in style. I remember wearing one in 6th grade and hating it. Then, again in maybe 2004, and now they are trendy again. Lots of stuff back then are making a comeback! I don’t have kids but I love all of these outfits, especially those fringe booties!! Do those come in adult sizes?? I know right! I want a pair! These are really cute picks! I love those brown boots! SO adorable!! The boots are too cute! Beautiful outfits. Very well chosen! Black leggings and a denim jacket is a staple in any wardrobe. I love the boots with fringe. So cute! My youngest daughter loves outfits like that! I love Joe Fresh cute, comfortable, and extremely fashionable! Love these kid’s fashions! They are absolutely perfect for back to school (and even when they aren’t in school!) Those black jeans are so cute! They’re perfect for any occasion! I have never heard of this company before but I will check them out for my daughter now. She is always on the lookout for new stuff that fits her personality. This would be perfect for her! I have never heard of Joe Fresh before. I seriously LOVE your choices. With three girls, I love fashion that will be relevant in a couple of years (as we pass down the clothes) and many of these styles are timeless. Joe Fresh is a Canadian brand. You’ll love everything they have there! I like the quality and the fun modern styles of Joe fresh. What a fun photo shoot with really nice clothing. I can’t wait to check out all their clothing and get something for my girls. They love photo shoots! I’m sure you’ll find their selection very pleasing! Never heard of Joe Fresh though I must say they have great products. All of the outfits they wore look beautiful and it suits them too. Thanks! Joe Fresh is a Canadian brand. I’ve never heard of Joe Fresh before, but it looks like they have some really cute outfits! I love how cute your kids look! I was so surprised to see what a large selection of clothing and footwear they actually have ! And shoes! They have such great choices. So adorable. That jean jacket is too cute. Makes me miss the days when my mom would take me shopping for a fresh wardrobe for school. Now I’m an adult and have to do it all on my own haha. Oh, I love that dress she’s wearing. Super cute! I’ll check it out. Thanks for sharing! Adorable outfits! I’ve never heard of Joe Fresh but so glad I’ve seen what they have to offer. It looks like they have a lot of great outfits. I always loved school shopping when my daughter was younger. They have so many cute clothes for boys and girls! I am loving that jean jacket and need it for my girls!!! Such cute clothing. They have such cute clothes. I am so glad I saw this post! I have to get the biker denim jackets for my twins. 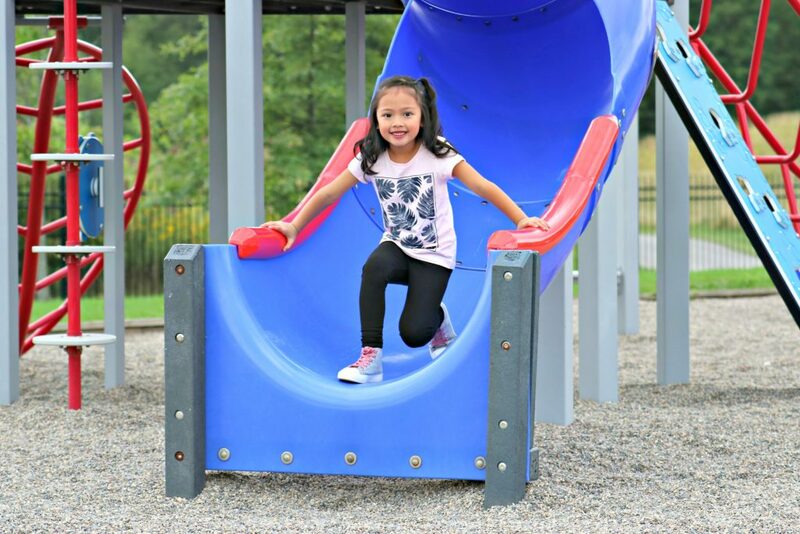 These look like stylish and comfortable outfits, perfect for active kids. 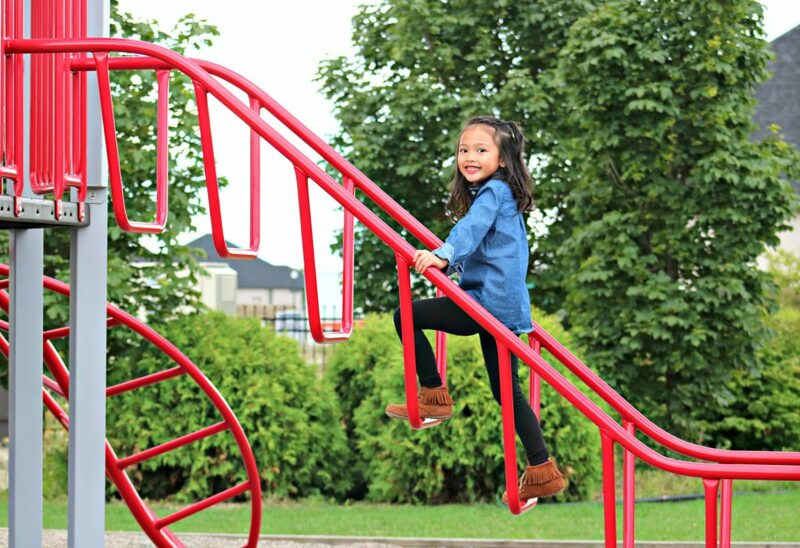 My oldest daughter is very active and she loves what Joe Fresh has to offer!